July 18, 2016 By Elise 6 Comments This post may contain affiliate links. Please read my disclosure policy for more info. My kids don’t like zucchini. It makes me kind of sad, because I love pretty much any kind of summer squash I can get my hands on. I suppose I can’t complain too much though – they do eat their share of other vegetables. But yeah… not zucchini. In fact, when they pushed their respective chairs up to the cupboard to ‘help’ me bake, they both started making phony gagging noises when I told them that yes, that pile of shredded zucchini was going into the batter. But as much as I tried to reassure them that they wouldn’t even taste the zucchini, they kept saying they weren’t even going to try them… right up until that delicious, warm, cinnamon aroma started wafting from the oven. Then their opinions started getting a little shaky, and in the end, Hadassah decided she should risk a small piece if we put enough butter on it. Next thing I knew, the muffins were all gone. Okay, so that’s an exaggeration. But all the muffins that I didn’t put away from tomorrow’s breakfast were all gone. This recipe is fairly simple – even though it kind of has a lot of ingredients – and it’s a variation on my favorite ever gluten-free zucchini bread recipe. The moistest, softest gluten-free zuke bread you’ll ever taste. 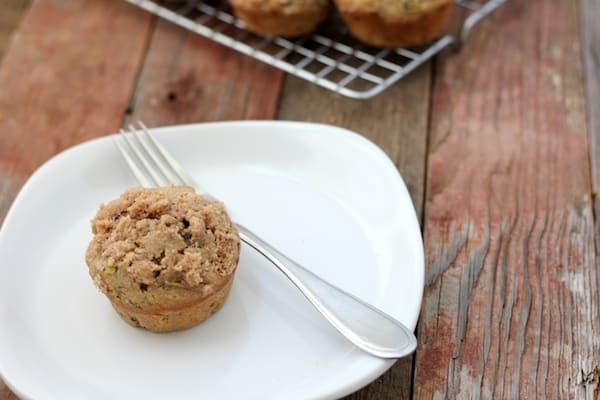 So needless to say, these muffins are nice and moist too, and have the added goodness of a streusel topping – and the cuteness of being muffin sized. Shred zucchini and add to banana/egg/oil mixture. Divide batter evenly between 18 greased muffin cups. 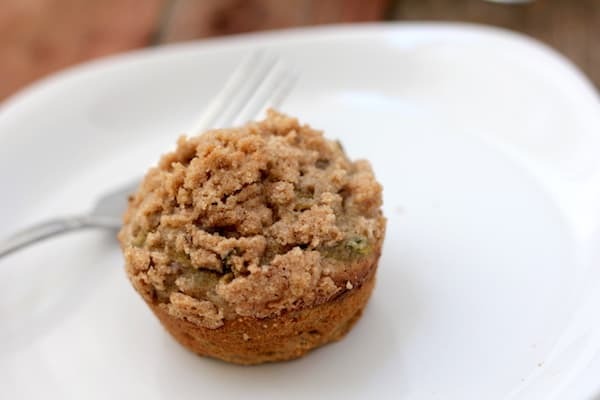 Combine all streusel ingredients together until crumbly and divide among muffins. Place the muffin pans in the center of the preheated oven, and bake, until the tops are golden brown and a toothpick inserted in the center of each loaf comes out clean (about 15-20 minutes). Loosen edges with a butter knife, and remove to a wire cooling grid to finish cooling. Ideally, you would let it cool completely before serving, but if you’re like me, hot muffins and butter is just too tempting, so enjoy! When does the stresuel topping go on? I’m assuming after you put the batter into the muffins tins? Also the gf flour for the topping – is that the same mix as in the muffins? Thanks! Sorry, one more question! 🙂 Can I use brown sugar instead of evaporated cane juice in the muffins? Thanks! Sorry for not clarifying that! 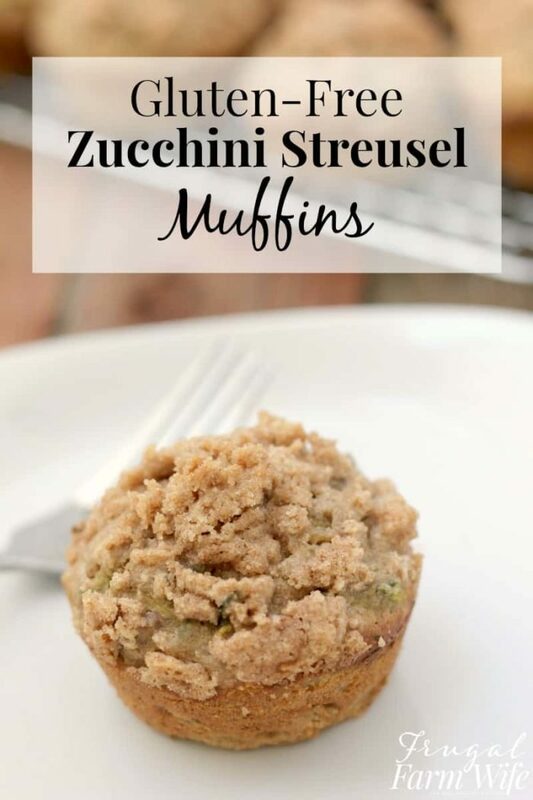 You put the streusel topping on just before the muffins go in the oven. I use a flour, or mix of flours that doesn’t contain starch because will cause the streusel to break down during baking. Rice, corn, buckwheat, millet, and sorghum flours all work well depending on your taste preference. Just wanted to tell you I made these and they are crazy good!!! Thank you Rhonda! Glad you liked them!